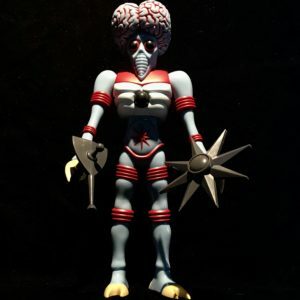 THIS NEW OUTER SPACE MEN INITIATIVE INTRODUCES THE FIRST EVER 12" VINYL COLOSSUS REX. THESE GLOW IN THE DARK AND BLANK VARIATIONS COMES INSIDE A NEW CUSTOM CREATED WINDOW BOX AND A KILLER SURPRISE COLORED MACE WEAPON. 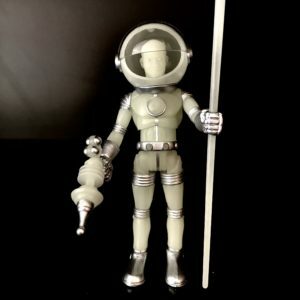 THIS NEW OUTER SPACE MEN INITIATIVE INTRODUCES THE SECOND 12" VINYL FIGURE. ORBITRON THE MAN FROM URANUS. THESE NEW INCREDIBLE WORKS OF ART ARE SOME OF THE BEST WORK THAT WE HAVE EVER DONE. THE PINK 1969 OG VERSION AS WELL AS THE BLUE 1955 METALUNA MUTANT VERSION COMES IN AN ALL NEW CUSTOM CREATED BOX. THE GLOW, BLACK AND PURPLE GLITTER VERSION WILL COME IN A FACTORY BAG AND HEADER CARD. EACH NEW ORBITRON COMES WITH 2 BRAND NEW WEAPONS THAT WILL BLOW YOUR AWAY. THIS IS THE ULTRA RARE 2013 GALACTIC HOLIDAY EDITION. 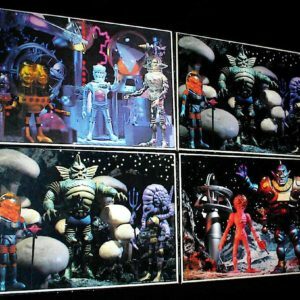 THE SET WAS CREATED BY THE ARTIST KNOWN AS NI AND THERE WERE ONLY 25 SETS CREATED GLOBALLY. 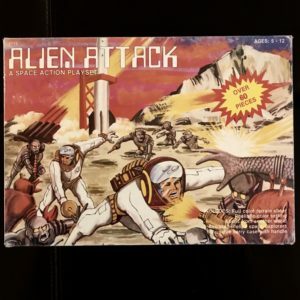 ONE OF THE RAREST TOYS THAT THE OUTER SPACE MEN APPEARED IN WAS THE CANADIAN ALIEN ATTACK GAME BY TYCO. THIS INCREDIBLE TOY CONTAINS A HUGE FOLD OUT PLASTIC TERRAIN PLAY MAT AS WELL AS DIECUT SPACE SHIPS AND DIECUT CARDBOARD MOUNTAINS AND HILLSIDES. THERE IS ALSO QUITE A SURPRISE; A BAG OF MINI GREY UNPAINTED PLASTIC OSM. 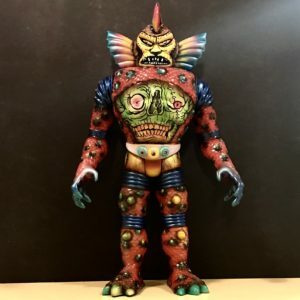 ONE OF THE RAREST JAPANESE SOFUBI VINYL FIGURES ARE THE BULLMARK OUTER SPACE MEN FIGURES KNOWN AS THE SPACE KING SERIES. 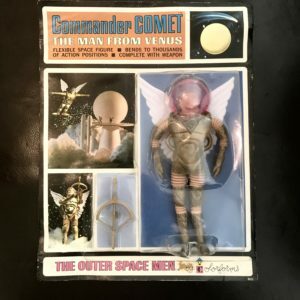 SIX OF THE ORIGINAL 1968 OSM WERE MADE INTO JAPANESE VINYL WITH ICONIC NAMES SUCH AS "KING VENUS" FOR COMMANDER COMET AND "KING SATURN" FOR XODIAC. 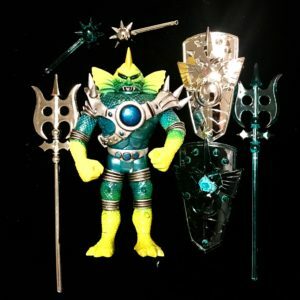 VINTAGE BULLMARK FIGURES ARE SOME OF THE RAREST OF THE RARE AND HERE THEY ARE; THE SPACE KING COLLECTION. 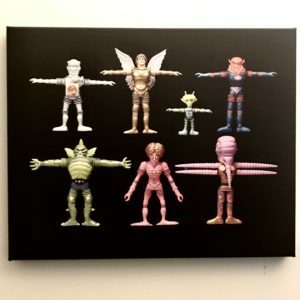 ONE OF THE MOST IMPORTANT PHOTOGRAPHS THAT MEL EVER TOOK IS OF THE FIRST SERIES PROTOTYPES SCULPTURES. THE PHOTO CAPTURED PERFECTLY THE PRISTINE JEWEL LIKE RADIANCE THAT EACH OF THE SCULPTURES EMITS. THE IMAGE SHOWS JUST HOW SPECTACULAR EACH OF THE SEVEN ALIENS REALLY ARE. HERE IS A 16" x 20" CANVAS PHOTO IMAGE OF THE PHOTOGRAPH FULLY FRAMED AND READY TO HANG OF THIS MAGNIFICENT IMAGE. THIS IS A TRIP INSIDE OF A TIME MACHINE. 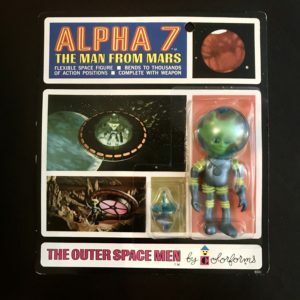 A TRIP THAT WHISKS YOU TO 1968 WHEN THE OUTER SPACE MEN FIRST ARRIVED AT THE LOCAL TOY STORES. 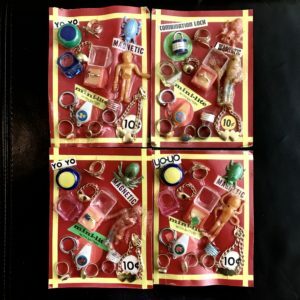 THESE CARDED GEMS ARE THE ORIGINAL WORKS OF ART CREATED BY MEL BIRNKRANT AND HAVE SURVIVED UNOPENED FOR 50 YEARS. COME TAKE A JOURNEY BACK IN TIME TO A WONDERFUL DISTANT PLACE AND RELIVE THE WONDER OF THE GREATEST TOYS EVER. 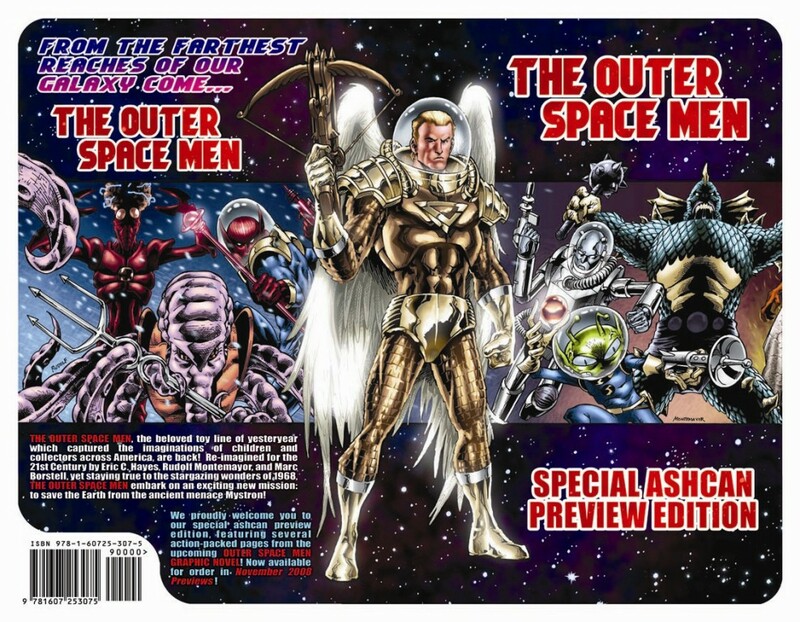 THIS IS THE VERY LIMITED EDITION OUTER SPACE MEN COFFEE TABLE BOOK. THIS WAS A LIMITED RUN OF 25 BOOKS GLOBALLY FROM 2013. THESE LAST FEW SPECIMENS ARE THE LAST TIME THE BOOK WILL BE AVAILABLE. THIS 40 PAGE 11" X 14" GIANT HARD COVER BOOK TAKES YOU THROUGH THE PICTORIAL HISTORY OF THE OSM STARTING WITH THE CONCEPT BOARDS CREATED BY MEL BIRNKRANT. THIS IS ONE OF THE MOST INCREDIBLE WALKS BACK INTO THE PAST 50 YEARS OF OSM HISTORY THAT YOU COULD EVER IMAGINE. IF YOU HAVE NEVER SEEN MY BOOTH AT COMIC CON THEN THIS IS THE EXPERIENCE THAT COMES AS CLOSE AS IT CAN TO BEING INSIDE THE OSM EXPERIENCE. TO BRING THIS 50TH ANNIVERSARY CELEBRATION EVER CLOSER TO THE END; WE ARE OFFERING THIS SUPER LIMITED EDITION OSM POSTER CREATED BY THE AMAZING ARTIST RON COMES. 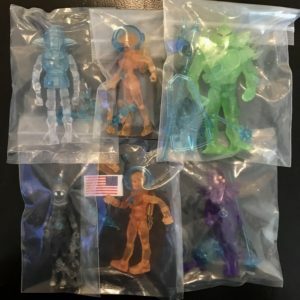 HERE YOU WILL FIND THE ABSOLUTE RAREST AND HARDEST TO ACQUIRE SETS OF OUTER SPACE MEN GLYOS SETS. WHETHER FROM SDCC OR NYCC OR COSMIC CREATOR SERIES; THESE COMPLETE SETS OF OSM ARE ALL MINT AND NEVER PLAYED WITH OR OPENED. 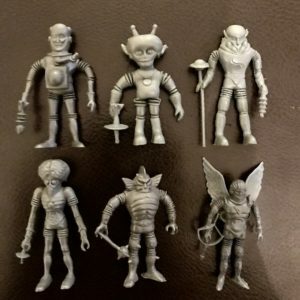 ONE OF THE RAREST VERSIONS OF THE OUTER SPACE MEN ARE THE MINI RUBBER JIGGLER GUMBALL VENDING MACHINE KNOCK OFFS. THESE ARE THE ACTUAL HEADER CARDS WHICH APPEARED IN THE FRONT OF THE MACHINE BEHIND THE GLASS, ADVERTISING WHAT YOU MAY GET WITHIN YOUR ROUND CAPSULE WHEN YOU PUT YOUR QUARTER INTO THE SLOT AND TURN THAT KNOB. 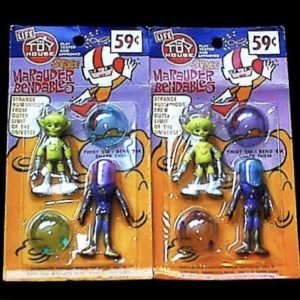 THESE INDIVIDUAL OUTER SPACE MEN FIGURES ARE EITHER STILL INSIDE THEIR FACTORY PACKAGING OR FRESH OUT OF THE PACKAGES. 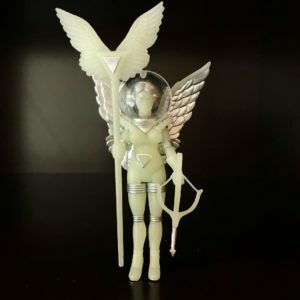 EACH FIGURE HAS NEVER BEEN PLAYED WITH AND ARE ALL IN GEM MINT CONDITION. THESE SINGLE OSM ARE WAITING TO TAKE THEIR PLACE INSIDE YOUR COLLECTION. HERE IS WHERE YOU WILL FIND THE BEST OF THE BEST OF THE VINTAGE OSM. THESE FIGURES HAVE PERFECT INTERNAL WIRES WITH MINIMAL PAINT LOSS. NO CHEWS, CRACKS, TEARS OR DAMAGE OF ANY KIND. THESE ARE ALL ORIGINAL FIGURES WITH ABSOLUTELY NO RESTORATION. 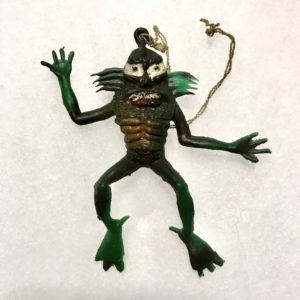 ONLY THE FINEST VINTAGE FIGURES ARE OFFERED HERE. 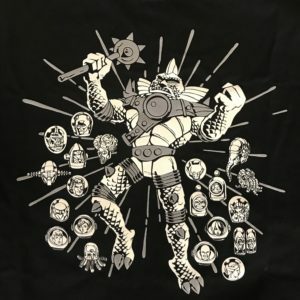 IN THE 1970'S THE JIGGLER COMMUNITY WAS SHOCKED TO FIND THAT COLOSSUS REX AND ORBITRON WAS MADE IN AN OILY JIGGLER FORMAT. 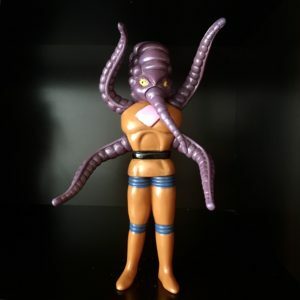 KNOWN AS "THE UGLIES" THESE RUBBER BENDY'S WERE WILDLY POPULAR. 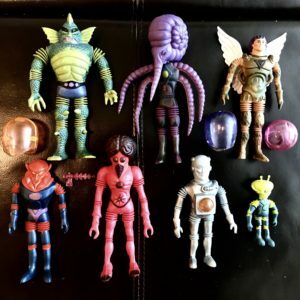 HERE ARE SOME VERY RARE EXAMPLES OF COMPLETE SETS OF 6 UGLIES WITH BOTH THE COLOSSUS REX AND ORBITRON KNOCKOFFS. 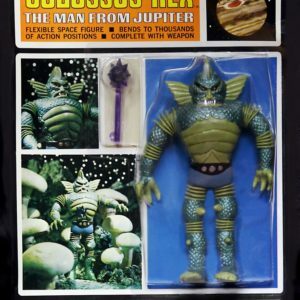 IN 1977 THE OUTER SPACE MEN REAPPEARED TO COMPETE WITH THE STAR WARS PHENOMENON. THERE ARE 4 PUZZLES IN THE COLLECTION AND IT IS ONE OF THE FIRST TIMES THAT THE PUBLIC WOULD SEE THE ICONIC SECOND SERIES OSM. THESE PUZZLES ARE INCREDIBLE AND PHOTOGRAPHS ARE AS A RESULT OF THE AMAZING MEL BIRNKRANT THE CREATOR OF THE OSM. 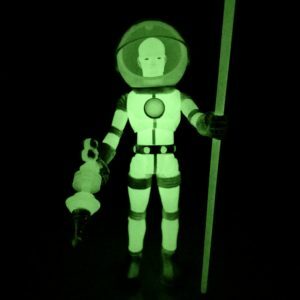 SOME OF THE MOST RECOGNIZABLE OUTER SPACE MEN IN THE WORLD ARE THE MINI CAKE TOPPERS. THESE TINY LITTLE PAINTED KNOCKOFFS APPEAR JUST ABOUT EVERYWHERE. THERE ARE 6 OUT OF THE ORIGINAL 7 THAT WERE COPIED. 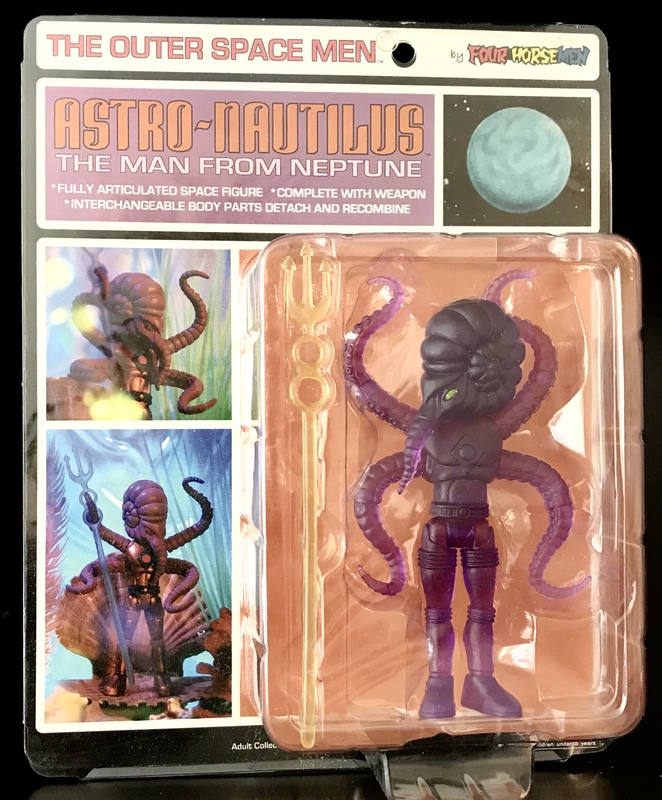 ASTRO NAUTILUS WITH HIS TENTACLES WAS NEVER MADE. TAKE A LOOK AT THE SLATE GREY SETS OF MINIS AS WELL. THESE WERE ONLY AVAILABLE IN THE FRENCH AND CANADIAN PLAYSETS. CREATED BY THE ICONIC YESTERDAYS AND COMPANY, THE OUTER SPACE MEN LAPEL PINS ARE MADE WITH THE UTMOST ATTENTION TO DETAIL. 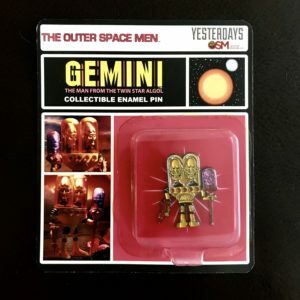 GEMINI STARTS THE LINE OF PINS AND THERE ARE NO LIMITS TO WHERE THE OSM PINS WILL GO. 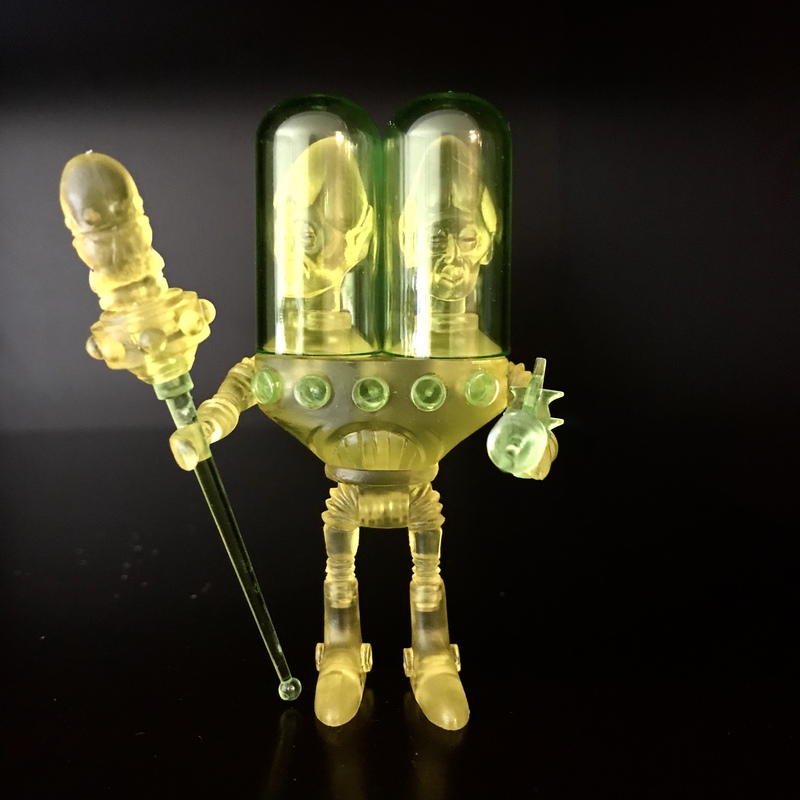 HERE YOU WILL FIND SOME OF THE RAREST CARDED SINGLE GLYOS OUTER SPACE MEN. 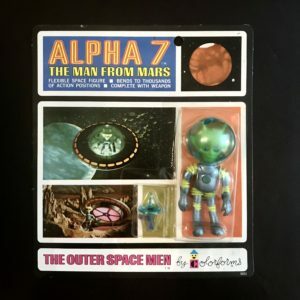 WHETHER IT IS A SUPER RARE HYBRID ONE OFF OR ULTRA RARE INDIVIDUAL CARDED COSMIC CREATOR SERIES; THIS IS THE PLACE TO FIND SOME OF THE MOST AMAZING CARDED OSM. 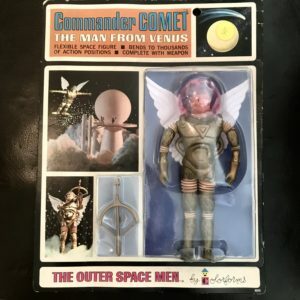 THIS IS THE RAREST OF ALL OF THE GLOBAL OUTER SPACE MEN KNOCKOFFS. 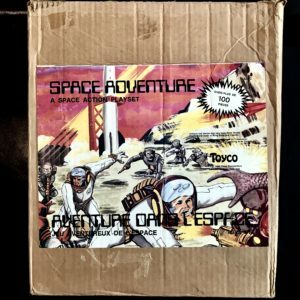 THIS IS THE FRENCH SET WHICH ORIGINALLY OFFERED THE COMPLETE SET OF GREY OSM, BLACK AND WHITE ASTRONAUTS, AND PLASTIC PLAY MAT. 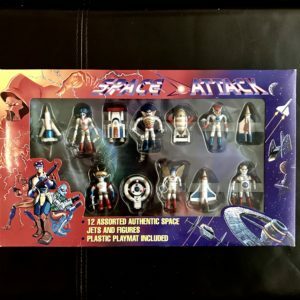 THIS SET HOWEVER CAME WITH A PLASTIC VACUFORMED PLANET SURFACE, A SPACE SHIP AND A ROCKET LAUNCHER ALL IN A PLAIN BROWN CARDBOARD BOX WITH A HUGE LABEL ON THE OUTSIDE. 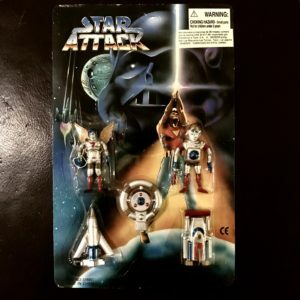 IN 1977 TO JOIN IN ON THE STAR WARS PHENOMENON COLORFORMS REINTRODUCED THE OSM TO A WORLD GONE WILD FOR SPACE AND SCIENCE FICTION THANKS TO LUKE SKYWALKER AND DARTH VADER. 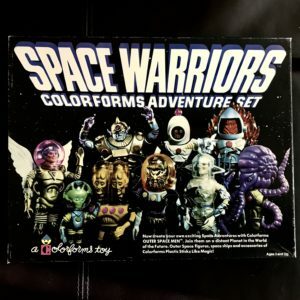 THE SPACE WARRIORS PLAYSET IS THE FIRST TIME THE OSM HAD BEEN SEEN SINCE 1968 AND NOW FOR THE FIRST TIME THE PUBLIC COULD SEE THE NEVER PRODUCED SECOND SERIES ON THE COVER. 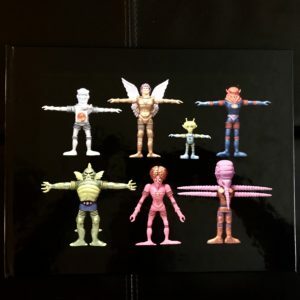 THIS IS THE TRUE COLORFORMS TOY WITH ALL OF THE PEEL AND STICK VINYL FOR HOURS OF FUN AND PLAY. 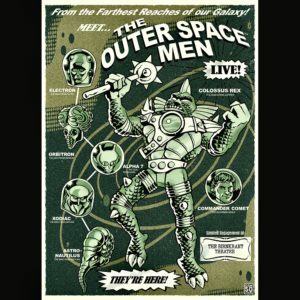 THE OUTER SPACE MEN WERE NOT LIMITED TO THE UNITED STATES. BY THE LATE 190'S TO THE MID 1980'S CHINA, JAPAN, FRANCE AND CANADA ALL HAD SOME VERSION OF A PLAYSET INCORPORATING THE SMALLER PLASTIC MOLDED CAKE TOPPERS AS THEY ARE OFTEN REFERRED TO. HERE IN THIS SECTION YOU WILL SEE SOME EXTRAORDINARY EXAMPLES OF THE OSM AS THEY APPEARED IN MANY DIFFERENT COUNTRIES. THE OUTER SPACE MEN TEE SHIRTS ARE MADE FROM THE FINEST 100% COTTON. THE IMAGES ON THE SHIRTS ARE MAGNIFICENT AND REPRESENT THE BEST PHOTOS THAT THE CREATOR OF THE OSM; MEL BIRNKRANT EVER TOOK. A FULL RANGE OF SIZES EXIST FOR YOU TO CHOOSE FROM. MAKE A STATEMENT AND WEAR AN OSM TEE SHIRT TODAY! THE INCREDIBLE WHITESTAR EDITION ALLOWS YOU TO EITHER CUSTOMIZE OR CREATE A COMPLETE BLANK WHITE SET WITH ONLY THE SMALLEST OF BLUE DETAIL. 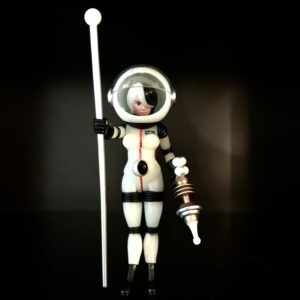 PERFECT FOR ARTISTS TO APPLY THEIR CRAFT AND ALLOWS THE MOST SERIOUS OF OSM COLLECTORS TO INCREASE THEIR UNIVERSE OF FIGURES.